The Belfast IRA’s attempt to raid the OTC Armoury in Campbell College on 27th December 1935 had ended in exchanges of gunfire with the RUC inside and outside the Hope family’s gate lodge home, a foot chase through the grounds and adjoining streets, the arrest of IRA volunteer Eddie McCartney and the wounding of RUC Constable Ian Hay. Immediately, further arrests followed and, whilst the Belfast IRA staff mulled over the possibility of an informer, they and the northern government squared up to each other across a court room and a case in which pretty much everyone lied through their teeth. On the Saturday morning after the Campbell College raid, Eddie McCartney was charged in the Police Court with illegal possession of a revolver and twelve rounds of ammunition with intent to endanger life. The court was presided over by Resident Magistrate, PJ O’Donoghue and the case against McCartney was made by District Inspector Geelan. McCartney was also now charged with possession of an explosive substance. First off, Sergeant John Connolly gave evidence against McCartney. He said he had been on duty with other police at 8.30 pm in Hawthornden Road when he heard shots from the gate lodge. He said he then saw seven men together at the main entrance, a group which included McCartney. When the RUC approached the gate, two ran towards the city direction and five away from the city. The court clerk asked if McCartney had anything to say and he replied: “I refuse to recognise this court, but I want to ask questions.” McCartney clicked his heels and came to attention, then did an about turn, before leaving the dock. He was remanded to appear in court the next Friday (3rd January 1936). That evening the RUC carried out numerous raids including houses and premises on the Falls Road, and on the Saturday night, in several public houses. Given that Connolly had inflated the number present at the gate, the suspicion was that the northern government would use the raid as a pretext to haul in a large number of republicans and intern them for a few months (such as happened in 1933). In one case, three plain clothes RUC men called at the home of Bernard Rooney in Thompson Street. Rooney was an IRA Second Lieutenant. Rooney had joined the Fianna around 1929 and in September 1931, he and his brother Patrick were among a Fianna slua from Ballymacarett who were arrested for suspected drilling in the Castlereagh Hills. He and Patrick spent a week in Belfast Jail but were released without charge. Since then he had been listed as a suspected republican. He was brought straight to Mountpottinger Barracks and detained there for the night. While there he was questioned about the Campbell College raid and put into an identification parade. Billy Hope, and his wife both failed to pick him out from the identification parade. On the Monday, Rooney was to be brought in front of the police court. Despite not being picked out during the identification parade, he was still charged with having a revolver and ammunition in his possession. Whether Billy Hope and his wife couldn’t, or hadn’t been able to, identify Rooney, isn’t clear (nor whether Rooney was actually present at Campbell College). But Rooney was detained in the Belfast Jail at Crumlin Road, all the same, as an RUC constable, Hopper, had testified against him and this was deemed sufficient evidence to hold him. The Sunday papers were full of stories about the raid. Constable Hay was 45 years old and married with one child. He had been in the RIC prior to the formation of the RUC and had served as a police officer in Belfast for 14 years. As Hay had been wounded a number of times, he was still in the Royal Victoria Hospital and had had an operation to remove two bullets, one from his right and one from his back. On the Sunday, the Belfast Commissioner of Police asked for information about a party of 8 young men who travelled on a Belmont tram from High Street out to Hawthornden Road, leaving the city centre at 8.10 pm. This was widely reported in the press on the following Monday. By the Monday the Belfast IRA staff and members of the unit involved in the raid were still in hiding to avoid the various swoops and arresting parties. Detention under the Civil Authorities (Special Powers) Act could mean being held up to four weeks, regardless of involvement or knowledge of the Campbell College raid, and refusing to answer questions put to you by a magistrate could then mean two months in jail (for not answering questions put to you by a magistrate). The IRA was also getting nervous about what had transpired on the night. How had so many RUC men happened to be in the vicinity? As part of IRA procedure, the Ulster No 1 Area Adjutant Jimmy Steele had to organise interviews with the various members who had participated in the Campbell College raid to prepare a report which was then sent on to the IRA’s Adjutant-General at GHQ in Dublin, Jim Killeen (Killeen was deputise as A/G since the actual A/G Donal O’Donoghue was serving a short prison term in Dublin). In this case the report would be more significant than usual and, despite the big RUC operation it would have to be done quickly in case more members of the unit got arrested. The Belfast staff began their analysis of the raid. It wasn’t clear from the statements given by the RUC in court whether the raid had failed through bad luck, or whether someone had tipped off the RUC. McCartney had been arrested at the scene by the RUC who were already there, either in waiting, or simply by accident. The Irish Press was reporting that the arms had been moved from the college prior to the raid, causing serious anxiety among the IRA on both sides of the border. As the proposal to raid Campbell College had originally come from GHQ, this partly explained some of the nervousness about the report in Dublin. The Commandant General of Ulster No 1 Area, Tony Lavery, asked Joe Hanna, as his Director of Intelligence, to check out the truth behind the statements that had been made just after the raid saying the arms had been moved from Campbell College in advance. Hanna told Lavery that his sources confirmed that the arms had not been shifted. More would become clear after Rooney was up in court on the Tuesday. Would the court, or even the RUC, dismiss the evidence given and drop the charges? On Tuesday morning, Constable Hopper gave evidence that he had picked Rooney out of an identification parade as one of the party of men who had approached the gate lodge on Hawthornden Road. As Rooney was an IRA man he was bound by Army Standing Order 24, which forbade recognition of the court, even asking questions about evidence that was being given was frowned upon. But Rooney was so incensed by Hoppers evidence, he asked if he could ask Hopper questions to prove “…he was telling nothing but lies”. The Magistrate then interrupted Rooney, saying he could give evidence at the proper time and must now confine himself to asking questions. “It is useless asking anything,” said Rooney (it isn’t actually clear from surviving sources whether Rooney was even involved in the raid). By the Tuesday, it was now clear that RUC did intend to press the charges against Rooney and also that they were going to perjure themselves in doing so. With a remand hearing scheduled for the Friday, the Belfast staff had to make a quick decision about what to do next. Rooney was in the IRA and so was bound by Standing Order 24. But he was a young man with a young family. The RUC were going to give false evidence that would see him convicted and receive a heavy sentence of, at least, several years imprisonment. McCartney, though, had been caught red-handed. Despite the direction from GHQ, Tony Lavery , authorised his Director of Finance, Liam Mulholland, to organise the funding for Rooney’s defence. Lavery had his own reasons to have Rooney defended in court. In trials involving republicans the RUC had little experience of being cross-examined. It was expected that defendants would conform with IRA Standing Orders and simply not recognise the court. So the RUC was relatively inexperienced in putting cases together and didn’t expect to have their evidence probed by a solicitor in an open court. But Lavery wanted to flush out enough details to decide if there was an informer and, as he saw it, an open court was the only way to do that. During that week the plan was laid, Lavery would defy GHQ and provide Rooney with a defence. His solicitor would challenge the evidence given, get Rooney off, and secondly, discover if the RUC were lying in wait at Campbell College. O’Donoghue, turning to RUC Inspector Geelan, remarked: “Some evidence should be brought against this man, since none has yet been brought.” Geelan responded by referring to the evidence given by Hopper the previous Tuesday. O’Donoghue agreed that this was evidence, whether it proved the charge or not. Campbell then requested to cross-examine Hopper but didn’t get the chance. O’Donoghue remanded McCartney and Rooney for another week. Campbell’s real cross-examination and, any evidence of an informer for the Belfast IRA staff, would have to wait. As reports of the trial spread, GHQ became increasingly irate about Rooney being defended in court. Having been so unequivocal in its stance over recognition of the courts and abstentionism on either side of the border, Rooney being defended left GHQ, senior IRA men and supporters feeling they were open to ridicule from their Free State counterparts (and at an awkward time with a new abstentionist political project, Cumann Poblachta na hÉireann, under development). At a meeting of the Army Council it was discussed and agreed that it would be best if Rooney read out a statement to the court to the effect that he no longer wished to be defended. He again remanded the two men for another week, by which time the RUC insisted they would have the case completed. The day after the hearing, McCartney’s words were widely reported in the press, making GHQ even twitchier in case McCartney too recognised the court to help Rooney fight his case. On the 20th January, the Adjutant-General of GHQ, Jim Killeen, wrote to Tony Lavery in his capacity as Commandant of No. 1 Division in the Ulster Area stating that the Army Council had ordered that legal aid to Rooney was to be withdrawn. From this point on, the stakes were getting increasingly high as Lavery was now guilty of disobeying a direct order from GHQ. The next Friday, the 24th came and went and McCartney and Rooney were remanded again. The main explanation given for the delay in the presentation of the RUC case was the condition of Constable Ian Hay who was still recovering from the wounds he received at Campbell College on the night of the raid. After the hearing Rooney was informed that he was being charged with attempted murder of Hay based on statements given by Hay in the hospital. A further week elapsed and at the remand hearing on the 31st January, Geelan announced that the Attorney General was bringing the further charge against Rooney of the attempted murder of Constable (since promoted to Sergeant) Ian Hay and that McCartney would also be charged with having documents related to the Irish Republican Army. On being charged, McCartney again refused to recognise the court while Rooney pleaded not guilty on all charges. Evidence was given against McCartney by Constables Massey, McTavish and Sergeant Connolly. Connolly again gave evidence against both Rooney and McCartney on the firearms charge. In McCartney’s case Connolly claimed that examination of his Smith and Wesson showed that an attempt had been made to fire two of the bullets but they hadn’t worked. Campbell did get to cross-examine Connolly on Rooney’s behalf and asked why the attempted murder charge had not been brought previously. Connolly claimed this was due to Hay’s condition, reminding the court that Hay was seriously ill in hospital. Massey gave evidence next. He described how he and a party of policemen were on duty at Hawthornden Road when they heard shots from the gate-lodge and bumped into a group of men, to whom they gave chase and then exchanged gunfire but only managed to capture McCartney. McTavish corroborated this story. Hay then gave his account of the evening to the court, describing how he had been on duty at the Hawthornden Road entrance and observed two short men and a taller man at the cottage, the last delaying outside and being framed by light emanating from the door of the cottage. Hay identified this last man as Rooney and went on to describe how he had wrapped a scarf around his head before entering the cottage. Hay related how he heard a scream, ran to the gate-lodge, losing his cap and then receiving a bullet wound on the shoulder as he reached the door. At the door, he saw Rooney, again, in the porch and, as he forced his way in, was wounded four times by Rooney and a second man who opened fire on him at a distance of around ten feet. Hay claimed that Rooney and the other IRA volunteer who opened fire used the younger woman and her children in the gate-lodge as shields. Hay also related how he got away shots and hit a third IRA man who collapsed to the ground. On being questioned by Campbell, Hay said that the exchange lasted around one minute. Billy Hope and his daughter, Mrs Gethy, also gave accounts of the shooting in the kitchen although neither gave testimony against either defendant. Based on that evidence, McCartney and Rooney were to be returned for trial on the charges next week. Now that Hay had recovered sufficiently, the RUC carried out more raids and arrests over the weekend. At 6 am on the Monday morning, John Monaghan was arrested and brought to a police station. Monaghan and others were then put into an identification parade. Hay identified Monaghan and a second man as having been at the gate-lodge on the night of the raid. The second man turned out to be a stand-in for the identification parade. Hugh Keenan was also brought in as part of the swoops. His house was raided by an RUC party under Head Constable Reid but they found nothing they could describe as incriminating. Regardless, Keenan was brought in and was put in an identification parade. Keenan, like Rooney, had been recruited into Na Fianna as part of Jimmy Steele and Tony Lavery’s re-organisation, begun in 1929. He had also been arrested for the suspected drilling in the Castlereagh Hills but had been allowed to go home (he was only 16 at the time). Since then, though, he was regularly detained for questioning, such as when RUC Constable Charles Anderson was shot dead guarding George Gibson’s house in Roumania Street Belfast in October 1933. He had also been hauled in after the tarring and feathering of a youth at St Matthews Church, after an arms raid at Ballymena and had been imprisoned with much of the Belfast staff, including Jimmy Steele, in November 1933. Hay picked him out too and he was also brought to the Police Court and charged. On the 15th February, John Monaghan and Hugh Keenan were brought to the magistrates’ court to have charges put to them. Despite the opposition from GHQ, Lavery and the Belfast IRA staff decided to continue with the defence and offered the same option to Keenan. As far as GHQ was concerned, not only was Rooney being defended in court a problem, it also claimed that defending him was responsible for the RUC deciding to go and arrest the two other men (implying it would manage to convict someone even if Rooney got off). This still had to be balanced against the risk that refusing to recognise the court would be tantamount to an admission of guilt by Monaghan and Keenan since Rooney, unlike them, was being defended. The newsletter produced by the publicity department of the Belfast IRA, An Síol, even made it clear in February that while both Rooney and Keenan were active republicans, Monaghan was not. 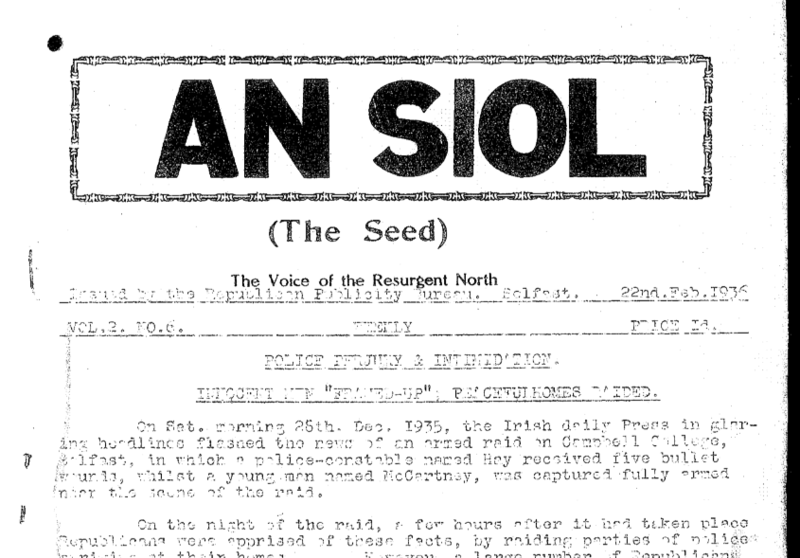 For good measure, the northern government decided to ban An Síol. Tensions were clearly rising. On the 10th February, two republicans were confronted by some RUC men at Turf Loney, off the Springfield Road. Shots were fired and one of the RUC men was wounded. Peter Fanning (from the Springfield Road), was charged by DI Hamilton, with being in possession of a copy of the 1916 proclamation, a document that Hamilton claimed was likely to cause disaffection. It was seized in a raid on the Wolfe Tone club (Fanning’s arrest was also put down to an informer). When Monaghan and Keenan appeared in court on the 14th February, both had legal representation. Monaghan was charged with the attempted murder of Constable Ian Hay, whilst Hugh Keenan was charged with possession of a weapon. Keenan was also represented by Campbell, like Rooney, whilst Tughan represented Monaghan. Tughan took a much more aggressive line of questioning than Campbell. Some of his questions may have come directly from Lavery or other members of the Belfast staff. The brief the legal team representing the three men had was simple – find out if the RUC had advance notice of the raid. Geelan continued in his role of making the RUC case, with O’Donoghue presiding again. Hay began his evidence by saying that Keenan was one of three men that he saw taking up position at the entrance to the gate-lodge. Geelan then started to ask Hay questions about what had happened on the night. However, Campbell objected to O’Donoghue that Geelan was simply leading Hay in giving evidence. O’Donoghue even sustained the objection and made Hay tell his story without Geelan’s prompts. Hay went on to describe how he saw various IRA men at the gates and then the gate-lodge and how he had picked out Monaghan. Tughan, representing Monaghan, then intervened and asked Hay about the parade and got him to admit that he had also identified a second man who had nothing to do with the raid. The Campbell College raid trial finally began at Belfast City Commission on the 20th February in front of Lord Justice Best at Crumlin Road court house with a jury sworn in. Keenan, McCartney, Monaghan and Rooney were all charged with shooting at Constable Ian Hay (since promoted to Sergeant) with intent to kill. All but McCartney, who continued to refuse to recognise the court, pleaded not guilty. The prosecutors for the crown were McGonigal and Dougherty (instructed by Dr Mills, the crown solicitor). Lowry and J.H. Campbell represented Rooney and Keenan, while Sheil represented Monaghan. The RUC men returned to the stand to give their evidence again. Hay gave his evidence again, saying that he was on duty at Hawthornden Road entrance at 8.30pm and that he had stood between the laurels and the walk. He claimed one of the IRA men who went into the gate-lodge was Rooney whom he had known for 10 years and another was Monaghan. He now claimed that after being shot at outside, the three IRA men inside had fired at him with revolvers and he had returned fire (contradicting his previous testimony where only two had fired at him). The only person hit at the gate-lodge was Hay. Hopper then repeated his testimony saying that he had recognised Rooney and Keenan among 10-12 men who stopped nearby under a lamp where he was also on duty at the Hawthornden Road entrance. He (Hopper) exchanged shots with this group once the shooting started at the gate-lodge. Connolly then told his story. He said he was in charge of a party of police 275 yards from the scene, and how he and Constable McTavish chased five IRA men and caught McCartney. Constable had chased two more but didn’t catch them. Connolly estimated that four IRA men had fired 20-25 shots and that they had returned fire. No-one appeared to have been hit on either side. Mrs Gethy and Billy Hope both gave accounts of what happened on the night. Next up, Rooney gave his testimony stating how he had been arrested and how he failed to be picked out at the identity parade and that it was only later that Hopper identified him. He recounted how he had been at work until 6.40 pm, had his tea at 7.30 pm, and then stayed at home with his seven week old child while his wife went out, and she had returned with friends at 8.20 pm. Lowry, acting for Rooney, pointed out that he was only hauled in because his name was in the police books since he had been suspected of illegal drilling in 1931. That ended the day’s proceedings and the jury was sequestered for the night. The next day, the 21st February, Rooney’s wife gave evidence that Rooney was at home all night (on the night of the raid). Rooney denied the charge and that he was a member of any illegal organisation. He said that Hay and Hopper had made false statements against him. McGonigal, for the prosecution, brought up that Rooney had been detained in September 1931 and claimed that he was engaged in illegal drilling at the time. Lowry (the barrister acting for Rooney) objected saying that it was being suggested that Rooney had been guilty of an offence on that occasion. Lord Justice Best said he would allow the prosecution to bring out the facts and that “This is one of the results of counsel making too good a case.” Lowry then retorted to Best that he resented the remark both for himself and for Rooney. Hugh Keenan told how he had been out on a walk with his girlfriend, Nellie McLoughlin, on the night of the raid until 11 pm. Nellie also gave evidence. John Monaghan testified that he didn’t know the other accused. How he was never a member of any organisation and had never been in police custody. He had been at Clonard Picture House the night of the raid with other young men. Rooney, Keenan and Monaghan were all acquitted and discharged. McCartney was found guilty as charged. He gave McCartney 10 years. While the acquittals were a partial success for Lavery’s strategy (and defiance of GHQ), the RUC evidence was still ambiguous. Clearly an unusually large number of RUC men were on duty around the Hawthornden Road entrance to Campbell College, including a Head Constable in the immediate area and a second party nearby. However, no-one appeared to have alerted Billy Hope and his family to the imminent raid and, as Hanna had assured him, the rifles had not been moved. Back on the 20th January, the Adjutant-General of GHQ, Jim Killeen, had written to Tony Lavery as Commandant of No. 1 Division in the Ulster Area stating that the Army Council had ordered that legal aid to Rooney was to be withdrawn. Since Lavery had not withdrawn the legal aid, GHQ debated what it should do. It decided that Lavery should be subjected to a court-martial in Crown Entry. That produced an even bigger disaster for the IRA which I’ll cover another day. The RUC and Ministry of Home Affairs typically added separate charges for both possession of a weapon and ammunition, the latter as possession of explosive substances. Letter from Adjutant General to Belfast Battalion, dated 20th January and captured at Treason cites the impact the Irish Press report had (see Irish Independent 30th May). Irish Independent May 30th states that, in documents uncovered later, assurances had been given to the Belfast Battalion commander (Lavery) that the arms had not been moved. I assuming this came from Hanna as Intelligence Officer. Munck and Rolston 1987, 183. His actually position was Commandant-General of Ulster Divisional Area No 1 (which was, effectively, Belfast). This is actually plausible as a number of people remember that ammunition left in dumps was often there too long and ended up ‘dozed’, that is, it wouldn’t discharge when an attempt was made to fire it. Little of Hay’s story appears corroborated by evidence at the scene or other eye witness testimony, such as wounding the third IRA volunteer. This IRA communiqué was later captured and read out in court (eg Donegal Democract 6.6.36). Events in between: A group of republican students met at Moira, where they were addressed by George Gilmore, Seamus Mallin, Mrs Margaret Buckley, Tom O’Hanrahan, Con Lehane, Sighle Humphreys and Frank Ryan. Hugh Carson, of Foundry Street, on the Newtonards Road, was found on a mid-week morning, tarred, feathered and chained to a lamp post in Comber Street (MacEoin 1997, 365). This entry was posted in 1930s and tagged Campbell College, courts, IRA. Bookmark the permalink. The banning of An Phoblacht, January 1926.